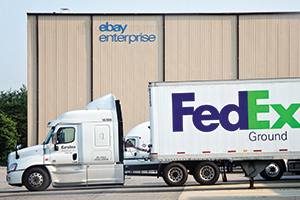 Clients of eBay Enterprise are expected to see faster delivery across North America when the company completes a 400,000-square-foot expansion in Henry County. The company expects to invest $5.8 million in the project, creating more than 190 full-time jobs. The expansion will provide automated fulfillment services as well as warehouse management and freight solutions for eBay Enterprise clients, including Bath & Body Works, Stein Mart and The Company Store. The company receives merchandise from client companies, fills orders and ships goods to customers. The addition of 190 employees will take the company’s full-time workforce to more than 500, according to Heath. “That makes them the largest nonmanufacturing company here, employment-wise,” he says. Once a hub for furniture and textile manufacturing, Martinsville frequently has recorded the highest unemployment rate in Virginia in recent years. In March, Martinsville’s jobless rate stood at 9.8 percent while Henry’s rate was 7.4 percent. The March unemployment rate for the entire commonwealth was 4.9 percent. The incentive package offered to eBay Enterprise includes assistance from the Virginia Jobs Investment Program and a $710,000 grant from the state Tobacco Commission. In addition, Henry County will provide Enterprise Zone incentives in the form of rebates on county taxes — 100 percent in the first year and 50 percent for four years thereafter. The company will take over the second of two buildings — it already occupies the first — on a former textile site known as Rich Acres in Ridgeway. The new facility will expand eBay Enterprise’s local presence to six buildings and increase its total footprint to 1.3 million square feet. “We will add material handling equipment and some automation to ensure our success,” says Kim Smith Glisson, the company’s director of operations.